Congressman Devin Nunes (R-CA) made it clear in his Sunday interview that just because the Democrats are taking back control of the House, he is not going stop working to get the truth out to the American people. 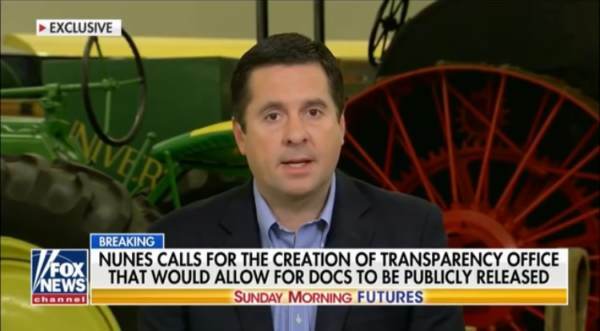 Outgoing House Intel Chairman Devin Nunes revealed to Maria Bartiromo on Fox News’ “Sunday Morning Futures,” how he plans to declassify the Carter Page FISA docs and other pertinent Russiagate records by going around “swamp creatures” who are trying to keep Americans in the dark. “Our investigation is essentially over. We have everything that we need. What we’re lacking now is that we’re lacking the declassification by the president,” Devin Nunes said. President Trump issued a declassification order of the Carter Page FISA docs and other Russiagate records in September then changed his mind after ‘foreign allies’ begged him to keep the documents under lock and key. These documents must be declassified if Trump truly wants to drain the swamp and the American people deserve to know what the FBI and DOJ were doing in their efforts to thwart a duly elected president.